Being familiar with the Lync Meeting features helps you find the option you want quickly and continue with your meeting smoothly, even if you need to use multiple menus. Keep in mind that most menus open when you point to an icon, and then you can click an option you want. 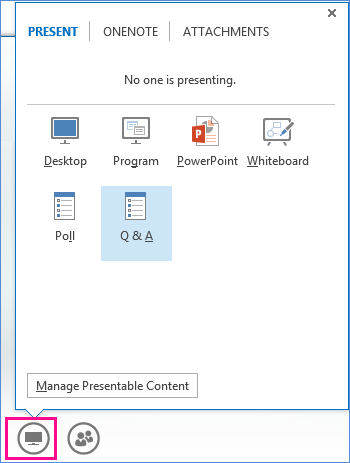 Tip: For an interactive guide to Lync Meeting presenter tasks, see Managing your Lync Meeting. The first thing you want to check is the audio controls, which you can find by pausing on the phone/mic icon. Here you can mute your audio, put audio on hold, change devices or transfer to another number. Adding video to your meeting can enhance your experience and help the participants be more interactive, just like a regular face-to-face meeting. First make sure your camera is connected and set up. Then, pause on the camera icon to see a preview and start your video. Click Invite More People to add additional participants. You can invite by selecting someone from the list, or by a phone number. Just type a number and click OK. Lync calls the person for you and adds them to the meeting. Note: Your account must be enabled for calling out a number, in order to invite someone by phone. Everyone an Attendee if you have too many presenters. 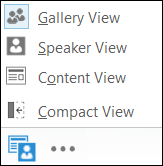 Depending on your meeting type, you can select a specific view of content, presenter, or participants. Gallery View shows all the participants’ pictures, or videos, plus meeting content. Speaker View shows the presenter’s picture or video at the lower-right corner of the meeting window, plus meeting content. 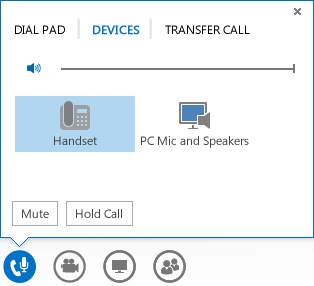 More Options menu includes information about the meeting, such as the meeting link, audio numbers and help menu. If you’re a presenter you’ll also see options to manage the meeting, (recording, meeting options and end meeting). 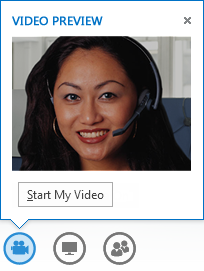 Start Recording: See Recording and playback a Lync Meeting for more information. Manage Recordings: lets you share, rename or delete a recording. See Lync recording manager for more information. IM Text Display Size: lets you choose the size of the instant messaging text in the meeting. Meeting Entry Info: includes the meeting link, audio numbers, conference ID and the organizer’s name. You can copy the information and send it to someone else who may want to join. 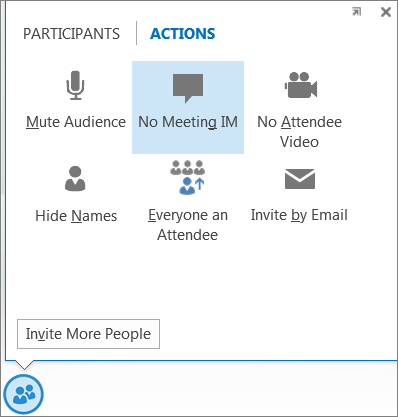 Lync Meeting Options : lets you change the meeting options, such as lobby, presenting and annotation permissions. End Meeting: closes the window and disconnects everyone from the meeting, including those participants who called in. Lync Help: opens the Lync help window. You can pick one of the options, or search for a help topic. 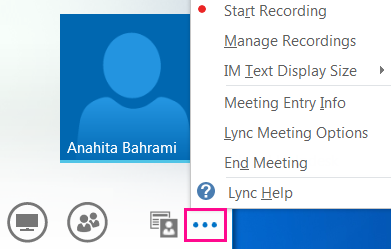 A nice feature of Lync Meetings is the ability to send IMs to everyone in the meeting. You can pause on the IM icon to access the window, or click the icon to dock the window in the meeting. When you dock the window, you’ll see more options such as choosing fonts, or adding smiley faces. You can also right-click in the IM window to access more options. Keep in mind that everyone in the meeting can see all the IMs. If you want to send someone a private message, go to the people menu, right-click a name, and then select the IM option.